In the heart of Domme, this amazing property belongs to the family of Stanley Kubrick. 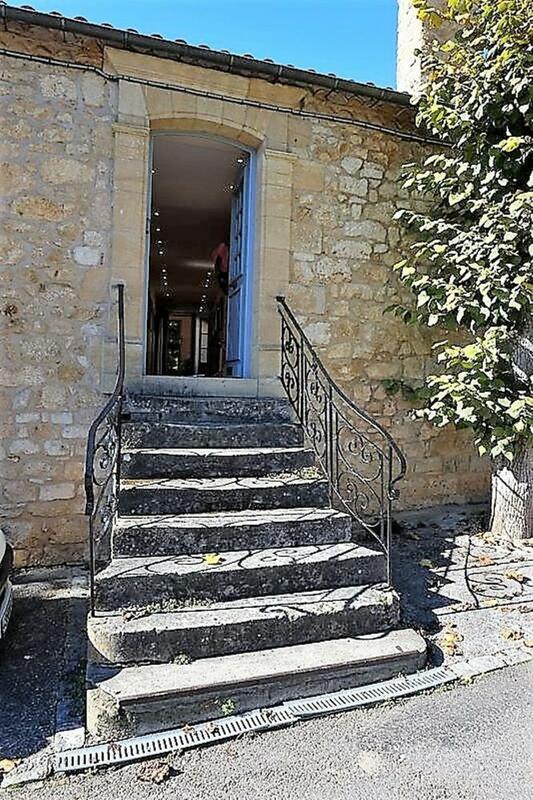 Completely renovated it offers 7 bedrooms, a private pool, a huge walled garden and views over the Dordogne valley. 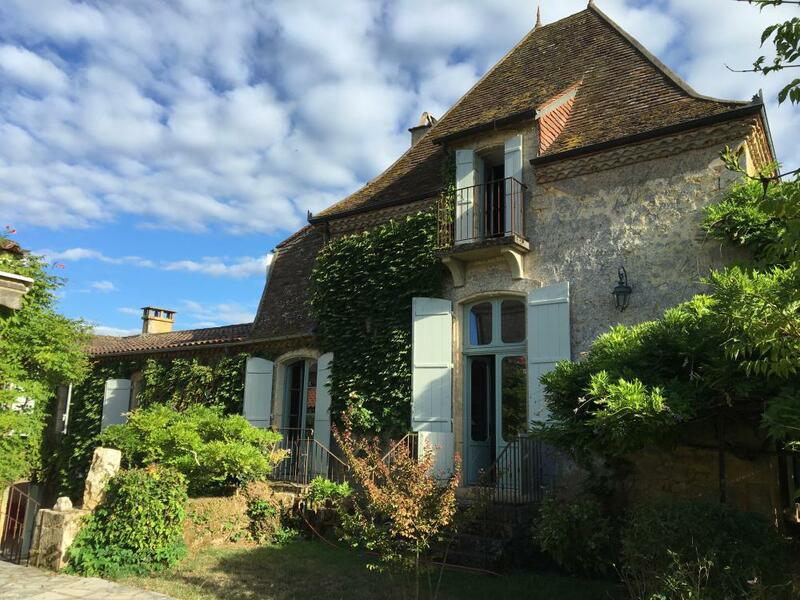 New to the rental market, this fabulous property offers a unique destination for a relaxing holiday in the Dordogne. Completely renovated in 2006 by the Kubrick family it proposes high quality accommodation for a large family or group of friends. 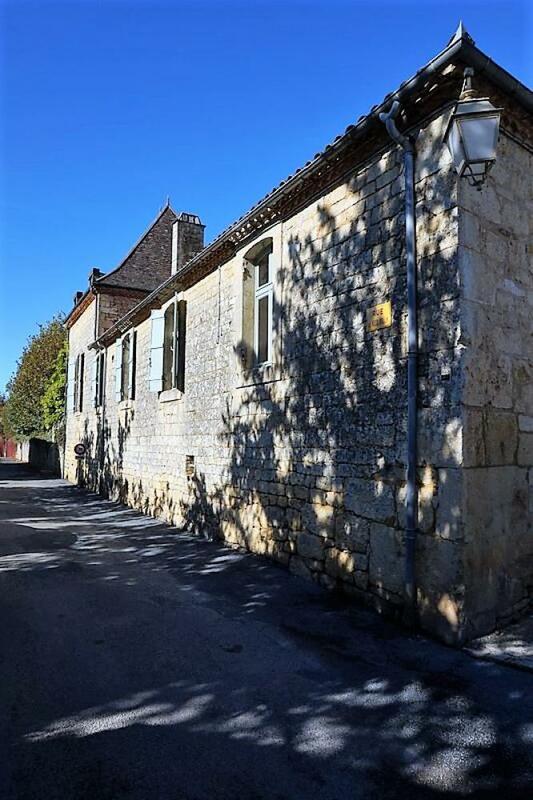 Set in the heart of the bastide of Domme, you will appreciate the peace of the huge walled garden, the panoramic views over the Dordogne valley, the private pool and the history which oozes out of the stone buildings. * a long corridor, lit by spotlights and lined with Mrs Kubrick's paintings, which invites you to discover the rooms leading off. * a spacious and elegant living room, offers comfortable sofas set around the stone fireplace, coffee tables and lamps. There is a flat screen TV, and large dining table seating 10. Three french doors open onto the wisteria covered terrace, where you can dine al fresco. The parquet floors and pannelled doors retain the character, whilst more paintings are cleverly spotlit to add atmosphere. * the large dining kitchen is superbly equipped with all recent equipment: side by side fridge freezer; oven; dishwasher; coffee machine; toaster; kettle.... The island offers an electric hob and plancha, with a suspended extractor fan above. A large farmhouse wooden table and benches are the ideal spot for informal dining in front of the majestic stone fireplace. Glazed doors lead out to the road in front of the house, and also to the terrace and garden to the rear. * Bedroom 1 offers two single beds which can be joined together to make a king size double bed, bedside tables and lamps, a dressing table and a wardrobe. * Bedroom 2 offers a king size double bed, marble fireplace, dressing table and built in storage acting as a bed head. It has its own wash basin cleverly concealed in a cupboard. 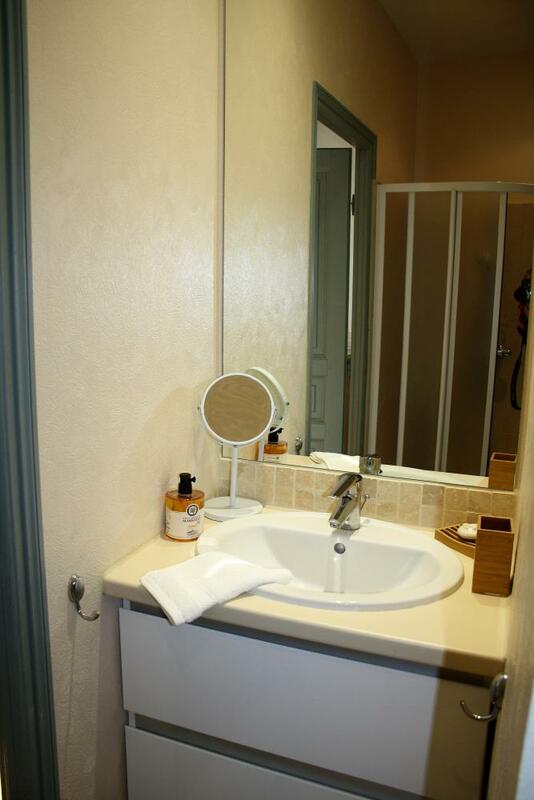 * these two bedrooms share a bathroom on the other side of the corridor with bath, shower over, and washbasin. * Bedroom 3 also offers two single beds which can be joined together to make a king size double bed, bedside tables, lamps and wardrobe. * leading off from this bedroom is an en suite shower room with shower and basin. 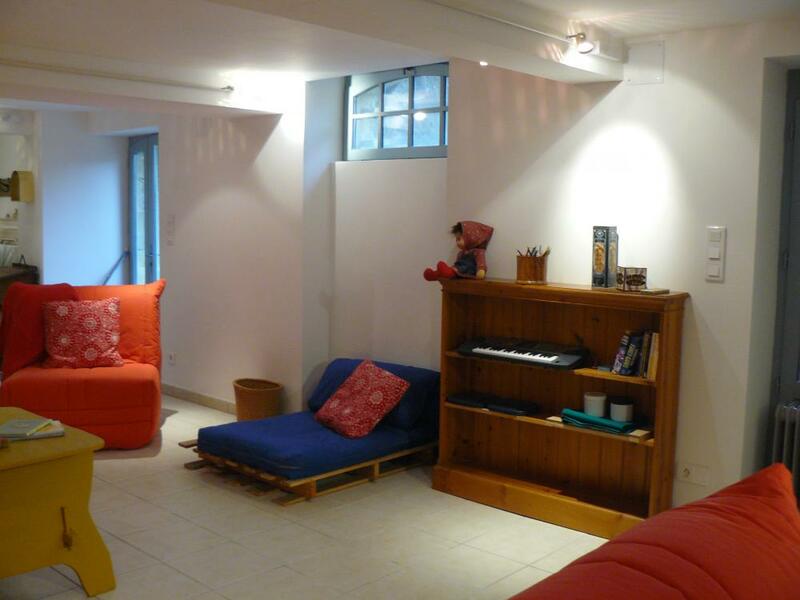 * Bedroom 4, has a single bed and is accessible either from the hallway, or from the shower room, ideal for a child wishing to sleep close to their parents. * Bedroom 5 - a huge master bedroom with large double bed, bedside tables and lamps. A glazed door opens onto a small wrought iron balcony.... Romeo, Romeo..
* this bedroom has the advantage of having an ensuite shower room with large shower cubicle, washbasin and toilet. Accessible from the exterior, the guest house forms the third side of the sunken courtyard and offers independent accommodation for up to 4 guests. * a second bedroom offers two single beds, and plenty of storage. * these two bedrooms share a bathroom with bath with shower over, basin and toilet. Accessible from the outside, leading off the sunken terrace is a large games room - paradise for our young (and young at heart!) guests! 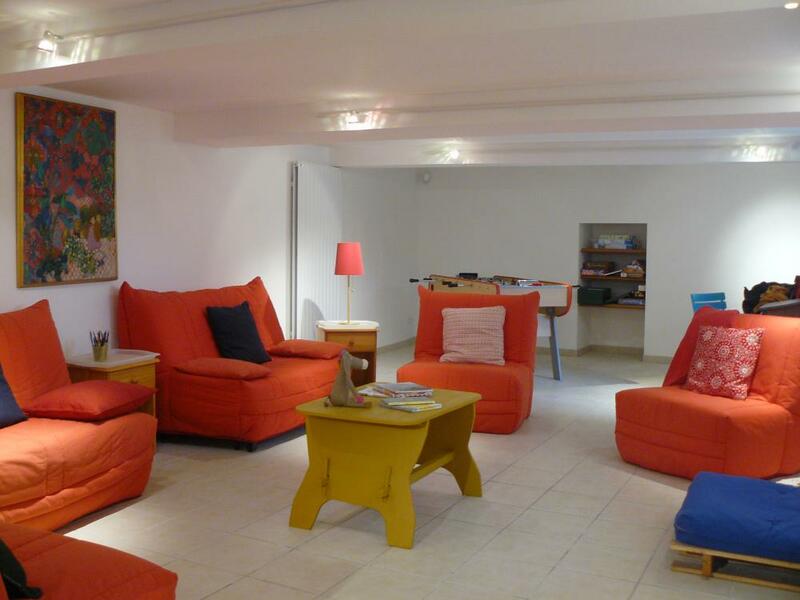 Offering sofas, table tennis, baby football, board games and books, it is ideal for occupying rainy days! Again independently accessible from the courtyard is a fabulous vaulted room - ideal for wine tasting!! 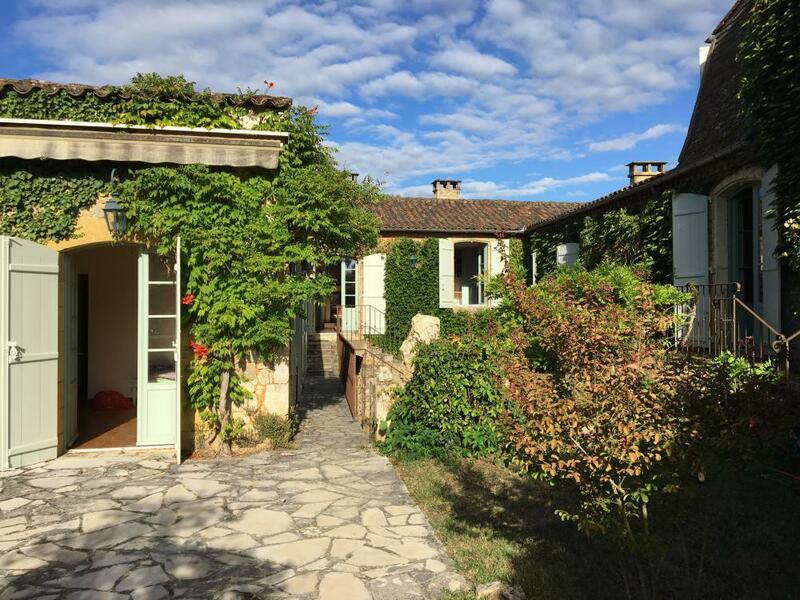 The property is set in over 4000m² of gardens, enclosed by stone walls ensuring complete privacy in the heart of the village. * A sunken terrace is situated below the kitchen, and offers a sheltered spot for dining or just simply relaxing, far from prying eyes. * The lovely private pool measures 8m x 4m, and is secured by an immerged alarm. Imagine relaxing under the pergola, with a glass of wine whilst the children play in the pool. * The huge garden comprises grassed areas, ideal for ball games, and hundred year old trees. From the end of the garden the panoramic view over the Dordogne valley below is quite simply spectacular. You can watch the hot air ballons rise above the mist in the early morning, or the sun go down in the evening. * An additional shower room, accessible from the exterior offers a shower, basin and toilet, is also available. 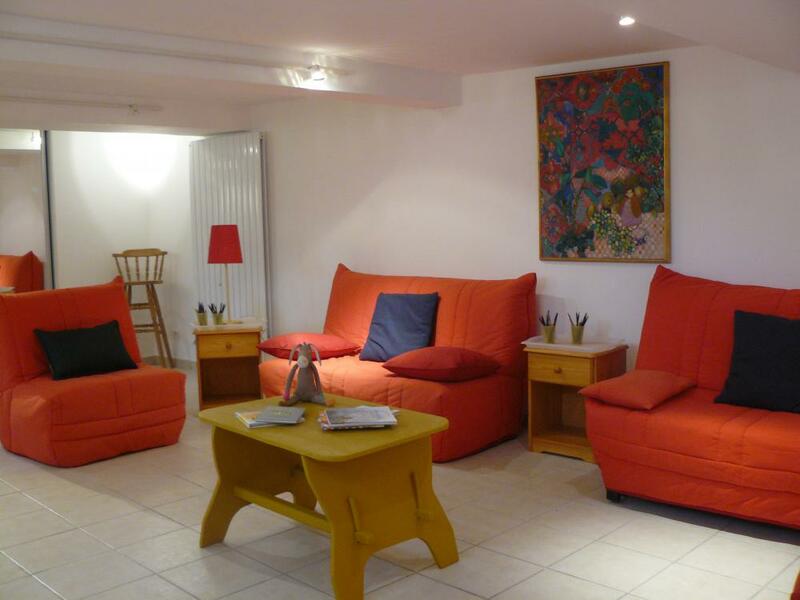 La Maison Kubrick offers the benefit of being set in the pretty village of Domme, with the shops and tasteful restaurants of the bastide are a short walking distance from the house. 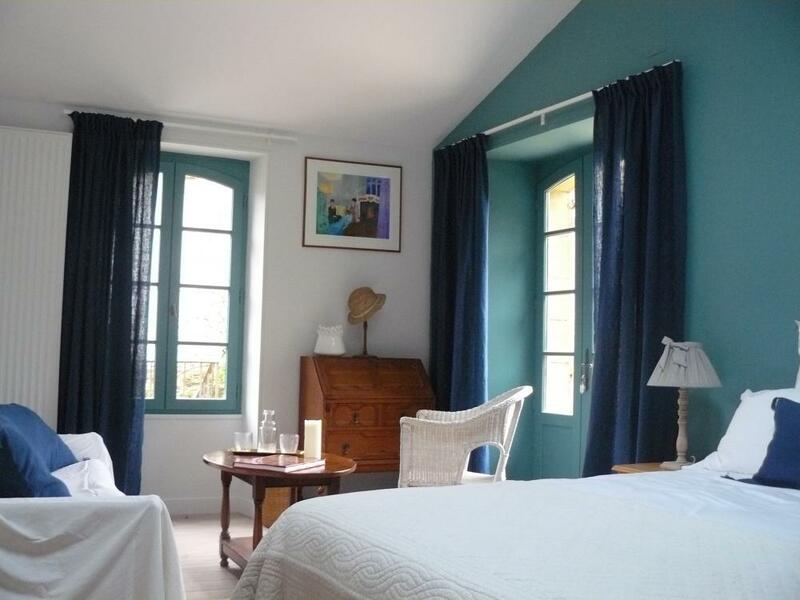 Domme is remarkably situated on a rocky crag overlooking the Dordogne Valley. 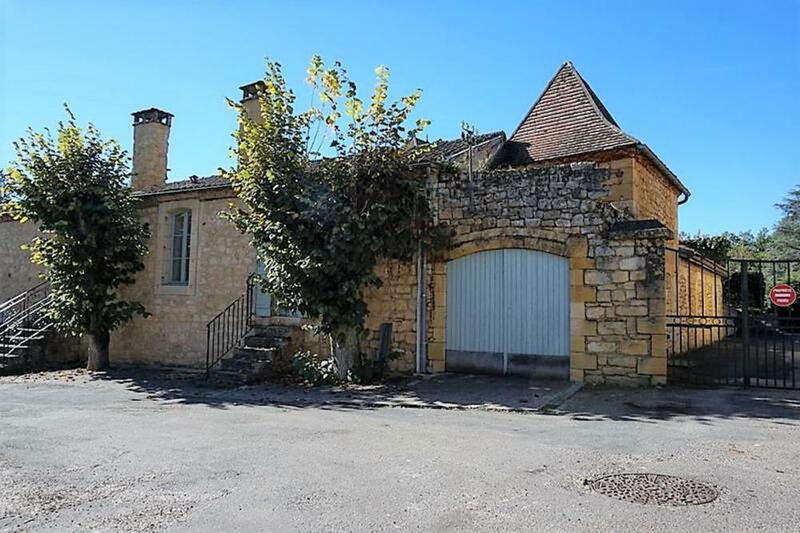 It is only a few kilometres from the lovely town of Sarlat and within easy reach of of the Caves of Lascaux and Padirac, as well as various châteaux - Beynac and Castelnaud being the best known. - remainder due a month prior arrival. - Returnable breakage deposit of 1500€ collected on the day of arrival.